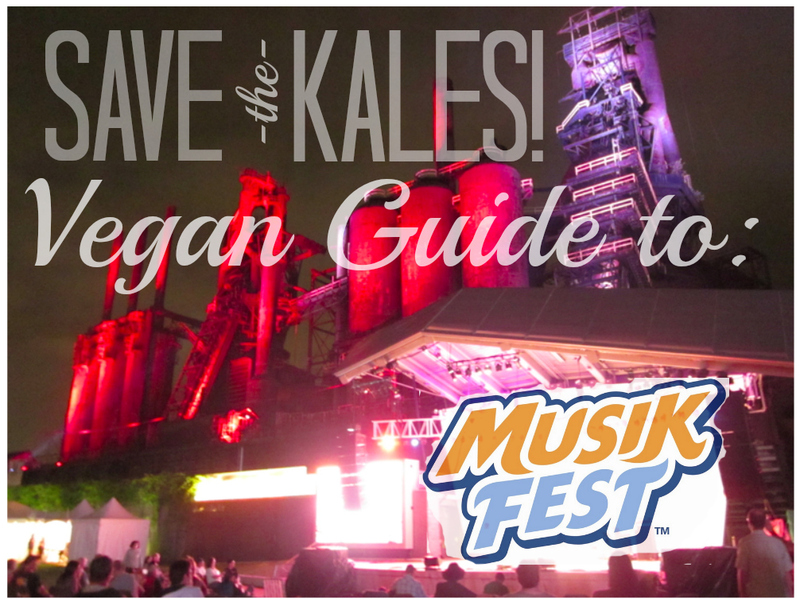 vegan lehigh valley | Save the Kales! 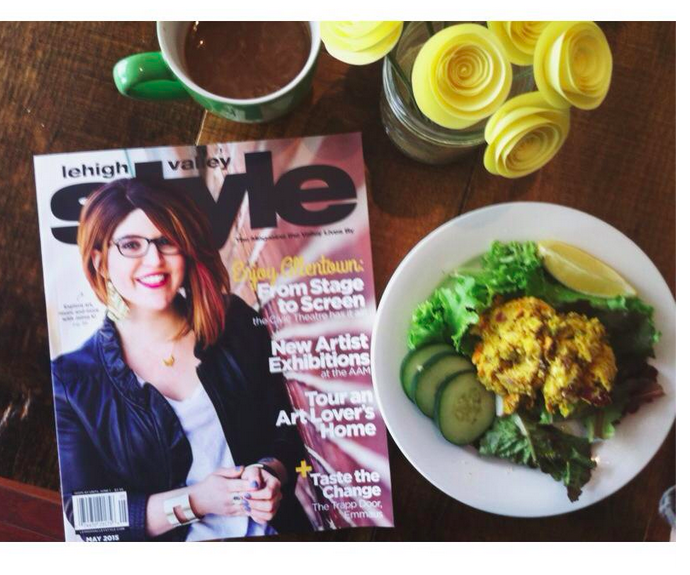 In the middle of January, we were shooting photos for my column in Lehigh Valley Style in a bookstore in Easton. I changed outfits next to the history books and me and Colin wandered into the alley. “Stand there, look happy”, he said when I crunched my way into a pile of ice-snow almost up to my knees and he took a few quick shots before the bitter biting winter air hurt too much to pretend it was Spring. Unknown to either of us, one of those photos became the May 2015 cover of Style. It is Colin’s first cover (something he has wanted for two years), and mine too (something I didn’t think was possible?). Surprise! In a year of so much loss, of leaving behind or moving on from so many of the things that were a part of me for so long, I have spent the last six months remembering how to be alone; how to find community when you leave the town where you lived for a decade; how to take a break from creative projects and hold on to the truth that it doesn’t mean they will crumble or you will be forgotten; how to focus on love for those who mean the most to me – to allow love to change when the time for change has come, to find it in my friends and my family and my friends who have become my family, to be surprised back into passion; to remember that things change but our value doesn’t increase or lessen because of it. It has not been easy. Important things never are. But I have found, over and over, that just when we are about to give up on ourselves something happens that reminds us that we are enough. That we will be OK, and we are already OK.
On Tuesday, May 12th, the magazine is having it’s monthly Insider Happy Hour, which is a FREE event and open to EVERYONE. You can wear a fancy outfit and bring a few dollars for drinks, and we can hug each other and get our pictures taken for the magazine. I hope to see you there! 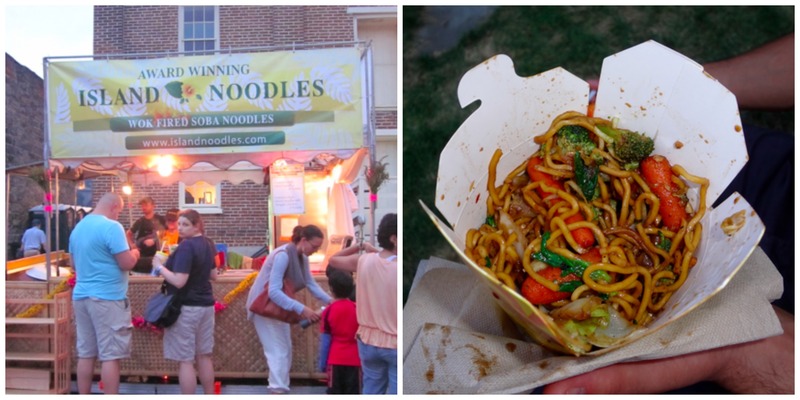 Disclaimer: Before we get into the best places to spend your food tickets at Musikfest 2014, I need to mention that this is meant to be helpful and fun. But PLEASE TAKE RESPONSIBILITY for your food – it never hurts to double check if cheese comes on a sandwich, or if a sauce is dairy-based. If someone puts ranch dressing all over your portobello wrap, please don’t be a jerk and write me an angry email about how I’m misleading the masses and my work is a sham and I’m the World’s Worst Vegan (if you do, it will promptly be deleted). Okie dokie? That said, if you have any tips about how to order something, or found food worth mentioning, please let me know! As of now I haven’t eaten everything listed and made notes where needed, but I’ll continue to update this post as I make my way through the end of the ‘Fest. Your help and info is appreciated. This list goes in geographical order, starting at the corner of Main + Broad Streets, down Main St., down the walkway behind the Hotel Bethlehem to the bottom (near Volksplatz), past Festplatz and Plaza Tropical (moving toward Sand Island), over the bridge to the Southside and following 1st Street to Steelstacks (Main Stage and Americaplatz). You can get a map here, or download the Musikfest app which is GREAT and very helpful. 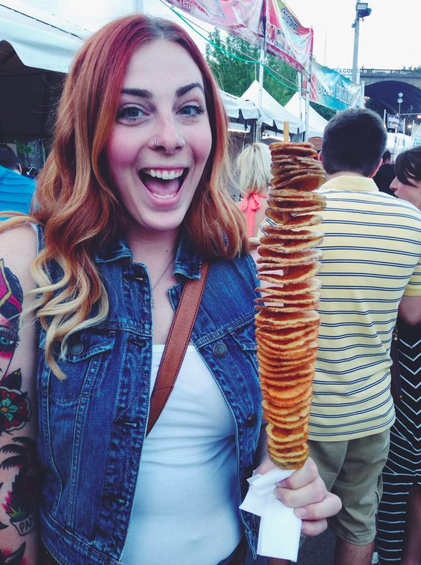 This list focuses on the things I think are most worthy of your Musikfest tickets, and does not include items you can easily find all over the Fest, like french fries, slushies, fresh lemonade, portobello wraps, and grilled veggies in various forms (wraps, sandwiches). 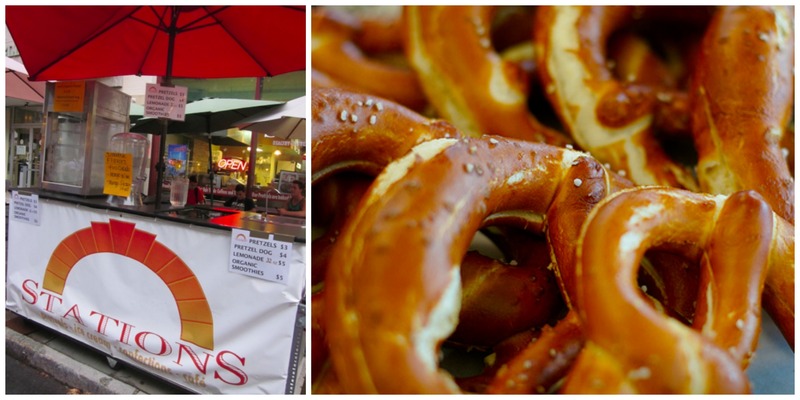 STATIONS CAFE: Main Street next to the Brew Works – A small cart with handmade soft pretzels from their larger storefront (right behind the cart, which does offer vegan options on a regular basis). These may be the most delicious soft pretzels you’ll ever have, as they are made with coconut oil. Sometimes they have pretzels with fresh baked jalapeno slices on top. Carb heaven. STATIONS CAFE: Soft pretzels made with coconut oil. MEDITERRANEAN PLATTER STAND (? 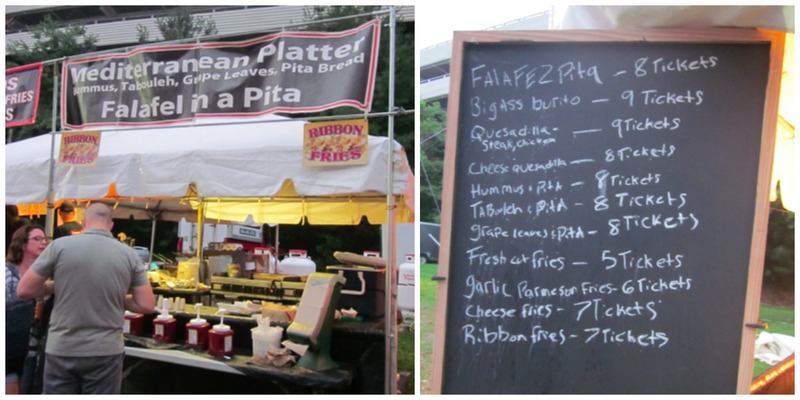 ): Bottom of the hill near Volksplatz – Falafel, hummus, tabouleh, stuffed grape leaves, and variations of all of the above sold in pita sandwich or platter form. *Make sure stuffed grape leaves are without meat. Order without tzatziki sauce. BEES KNEES GRILL: Bottom of the hill near Volkzplatz – OH MY GOSH! VEGAN GRILLED CHEESE. Hot sandwiches with fresh ingredients, including a TEMPEH + KIMCHI REUBEN with vegan cheese. Also vegan mozzarella, pesto, tempeh, arugula, avocado, & tomato on rye bread. They toast them using coconut oil instead of butter. *Plus we want to give a big internet/real life hug to these folks who saw the need for more vegan options THANKS TO ALL OF US (high five!) and came up with awesome vegan versions of their sandwiches. Go here. Go here. Go here. BEES KNEES: Tempeh and avocados and arugula. Vegan grilled cheeses from BEES KNEES GRILL. Messy and delicious. CACTUS BLUE: North and South sides. Tacos, beans and rice, lots of guacamole. 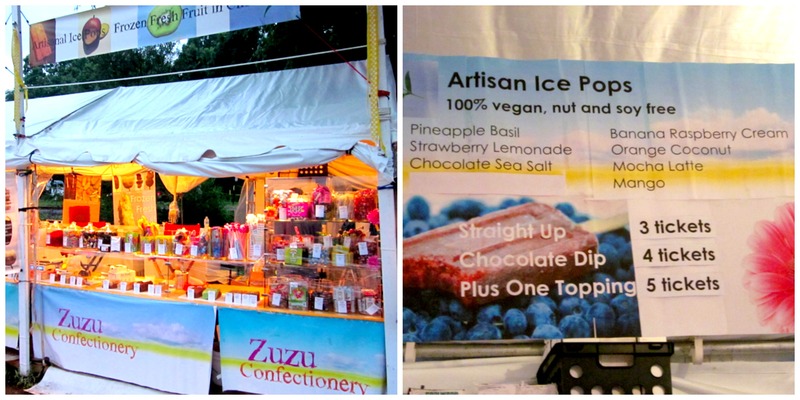 ZUZU CONFECTIONERY: Near Volkzplatz – Gourmet popsicles that are vegan, nut, and soy free. Flavors include Pineapple Basil, Orange Coconut and Chocolate Sea Salt, among others. An upscale and more budget-friendly treat. SPIRAL FRIED POTATO, somewhere, not sure where: Erin sent us this picture of a whole potato cut into an edible slinky then fried and covered in spices. I’ll be on the lookout for this to find the location, but in the meantime, it exists! CASA DE JORGE SALSA (“THE SALSA GUY”): In Handwerkplatz, the section for crafters and makers, behind the Hotel Bethlehem – Not a food vendor, per se, but George is a nice local guy and makes unique varieties of salsa. He was happy to tell me he stopped using honey and now uses agave for sweetener, so nearly all flavors are vegan. You can sample his salsas and buy several to take home. If you’re up for a challenge, try his infamous “Stupid Hot” salsa and he’ll take a picture of your face as you regret your decision and put it on the Facebook page. Bonus: say hello to CHLOE THE SALSA DOG! 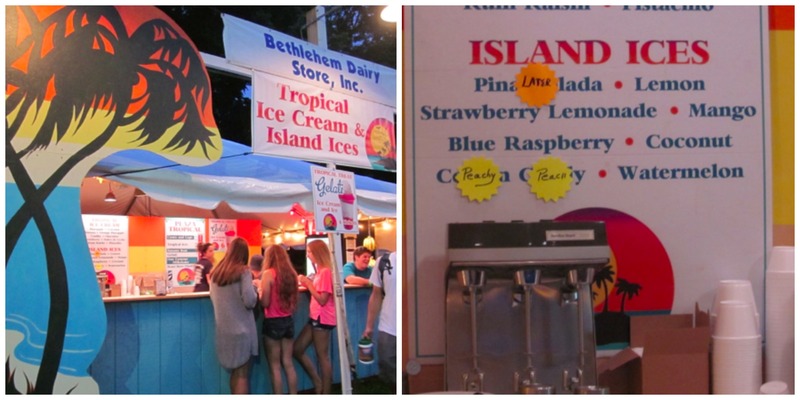 BETHLEHEM DAIRY STORE: Near Plaza Tropical – A decent selection of locally made flavored ice. Imagine a cross between Rita’s water ice and sherbet. Nothing fancy, but it’s tasty and refreshing and a good option for kids. 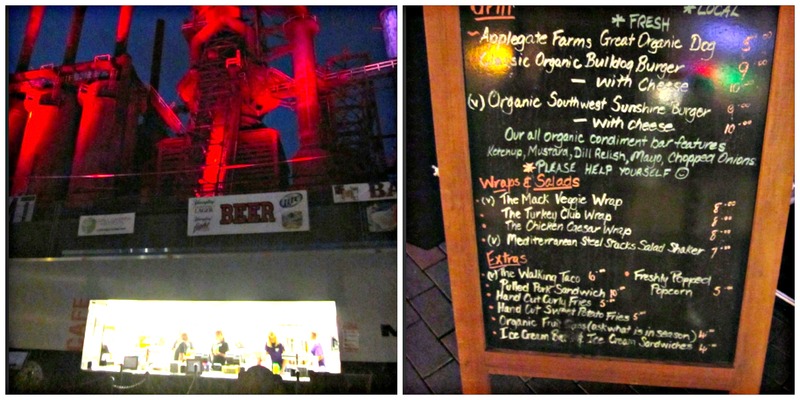 Rodale’s Mack Truck Cafe: At Steelstacks at the Levitt Pavilion/Americaplatz – Organic + local, Rodale operates this space YEAR ROUND for Levitt Pavilion shows, and Musikfest. The best choices are the veggie wrap with tofu, and the handcut sweet potato fries. 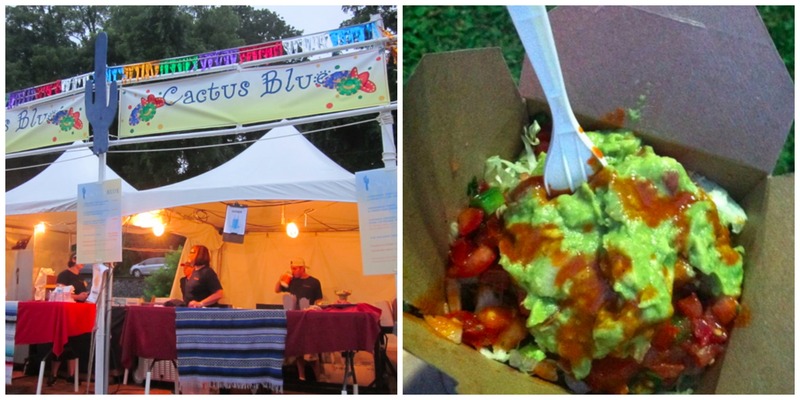 *CACTUS BLUE and ISLAND NOODLES (see above) also have second locations at Steelstacks on the Southside. THE JOINT is a coffee shop on North Side, just off Main Street in the Sun Inn Courtyard/Leiderplatz, that serves great coffee and has almond milk and usually a vegan soup and/or sandwich of the day, like a tofu bahn mi or chickpea salad (info on Facebook). During Musikfest they are serving up roasted chickpeas, and tater tots with a bunch of locally-made hot sauces, $2/each. Great people, vegan-friendly, much love. SHANKARA is an all-vegan organic juice bar and eatery on the Southside a few minute walk from Steelstacks if you’re in need of health-focused and always delicious fusion food. You can get fresh juices, intensely creative organic meals, and Sunday Brunch. If you’re having dinner, reservations are recommended. (Call or text: 484.330.6405) Always-updated info on the Shankara Facebook Page. Honestly, it doesn’t matter what you order, it’ll be amazing. SHANKARA: All-vegan all the time. Organic juice bar and fusion food. Remember, I’d love to see your photos or hear your recommendations. I can update the list all week. Take all the tastiness of pineapple upside-down cake, and make a healthier, no-bake, raw vegan version! Note that raw cherries would make this a truly raw dish, but you can find vegan maraschino cherries in stores or online. I think they taste a little more old school that way. Put the first four ingredients into a mixing bowl and mix well with your hands to create a “dough”. Roll the dough into small balls, then roll in a plate of dried coconut to coat. Use your thumb to press into the balls and create a small space to put 1/2 of a cherry. Ta-da! Avocados and coconut are proof that maybe that little blonde boy knows his stuff and Heaven IS for real. 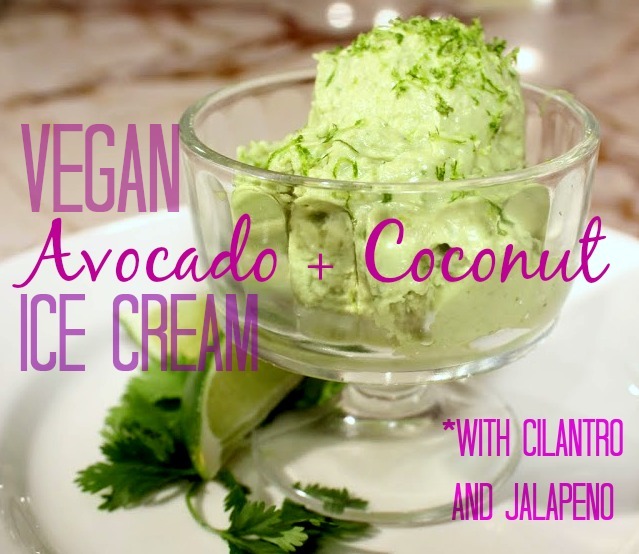 In this recipe, I blend them with fresh cilantro and just a touch of jalapeno pepper for a sweet and savory vegan ice cream! No ice cream machine is needed – just a blender, a shallow dish, and a freezer. Add all ingredients to a blender and blend until smooth. Scoop ice cream base into a shallow dish and spread out evenly. Put in the freezer for at least 1-2 hours. If ice cream is too hard to scoop when you take it out of the freezer, let it sit on the counter for a few minutes to soften. Garnish with lime zest. One month ago (wow, it’s been that long), I went to the doctor to discuss sciatica pain and some annoying neck/shoulder tension in the hopes of getting a referral for some physical therapy. I was given four shots in my back + shoulder to relieve some of the pain immediately. I was asked to sit on a stool with wheels, no back and no arms, and after the shots the doctors left the room and – woopsies!- I had a reaction, passed out, and hit my head on the floor. I was told they only knew I passed out because they heard the sound it made when I fell. Cringe-worthy, right? Concussion Chic. 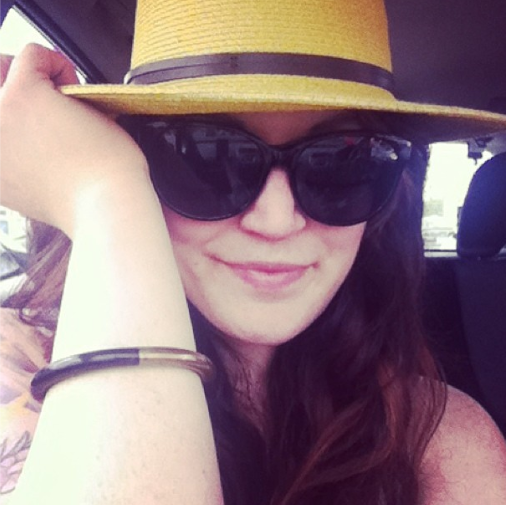 Thankfully I got this summer hat and a bunch of sunglasses a week before this happened. Now I can grocery shop with protection + unwashed hair, but give the illusion of being pulled together. Smoke and mirrors! The doctor said: “Don’t use the computer. Don’t text or be on the phone very much. Don’t watch TV or movies. And don’t read. (!!!) They cause eye strain.” I’m not an overly-gadgety person, but it was a wake-up call to see how much I rely on each of these activities throughout the course of a day. The first week was a doozy, physically and, eventually, emotionally and mentally. All that time to myself without aid of my usual distractions was enlightening and terrifying. I felt free. I felt trapped. I felt unconstrained of obligations and sank into relaxation. I felt agitated that I had to cancel my work and responsibilities and worried everything would fall apart and everyone would resent me. I questioned the meaning of life a hundred times a day. Occasionally I found it while watching the rain from my front porch. You worry that people are going to be angry because you have to miss deadlines, postpone interviews, not show up. You worry your absence will make everything else come to a screeching halt and the guilt of that is oppressive and lodges heavy in your guts. Then, when life goes on and the rest of the world continues to work and exist without you, you are left with the feeling that you don’t actually matter that much. A relief, a poison, in equal doses. 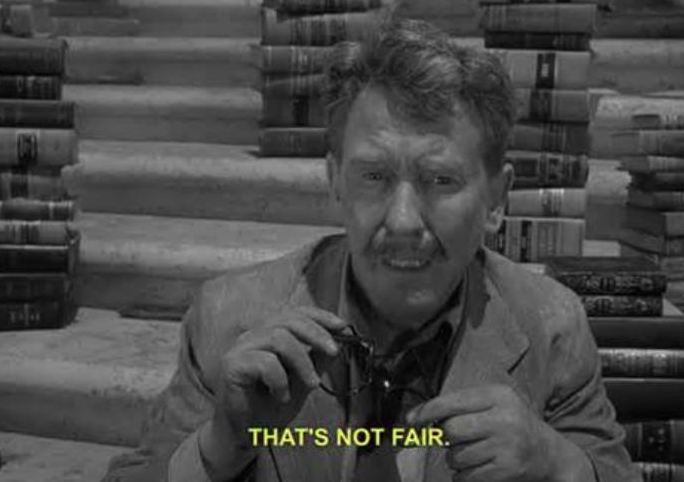 I’ve been dealing with the guilt of canceling appointments and having to bail out of obligations, projects and work. Getting rest is the only thing that will help, and while that’s how I’ve been spending most of my time, I’ve been able to take advantage of a few social events that have maintained my sanity. When you get most energized by spending time connecting to people in person, isolation is loneliness emphasized. Stumbling across one of my favorite book sales and getting 30+ titles (for about $10 bucks and all money went to charity! ), including some truly exceptional gems that still make me feel smugly proud of myself, like: titles by Sylvia Plath, Richard Brautigan and Lorrie Moore I didn’t previously own; a first edition of Nicole Krauss’ The History of Love, one of my favorite books ever ever ever; an extravaganza of queer authors like Jeanette Winterson, Sarah Waters and Oscar Wilde; an astrology book from the 1960’s with dreamy illustrations. I was able to read again after the first week, thank goodness. Get lost in the stars. Mornings spent on my cozy front porch, working through The Artists Way, getting uncomfortable and vulnerable and angry and then inspired, focused, driven. Salads for breakfast. Tiny pieces of paper tucked into my Chinese takeout that make me feel hopeful. 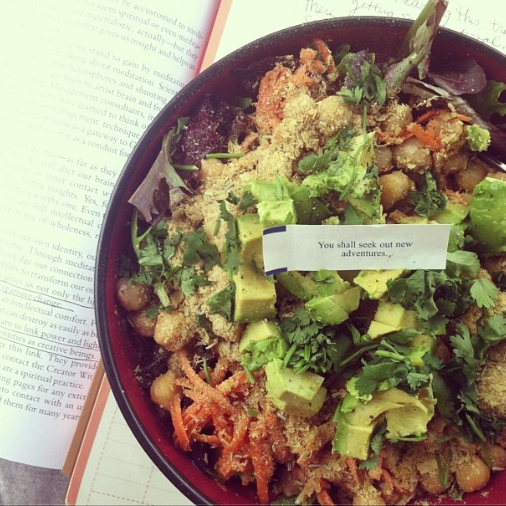 Avocados on everything, morning pages, sunshine. A Mother’s Day surprise from Chubby and Pierogi (my dog and cat) left on the kitchen table, discovered when I woke up to make coffee. I’ve been told they must have stolen the car with Pierogi at the wheel, Chubby at the gas + brakes (his arms are too short to operate the wheel) and took themselves shopping. What sweet angels. 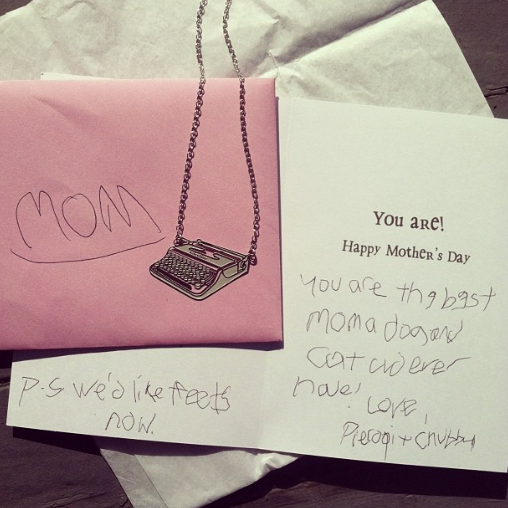 Typewriter necklace and a handwritten (paw-written) card from the cat and dog. They are so talented! I went to the Spiritual + Holistic Expo which was like a warehouse full of healers, luscious self-help books, massive jewelry pieces, and hundreds of things I’ve never seen and still don’t entirely understand. I ran into friends, the kinds of friends who give meaningful hugs and words of support and encouragement. There’s another expo in September and I’m already excited. 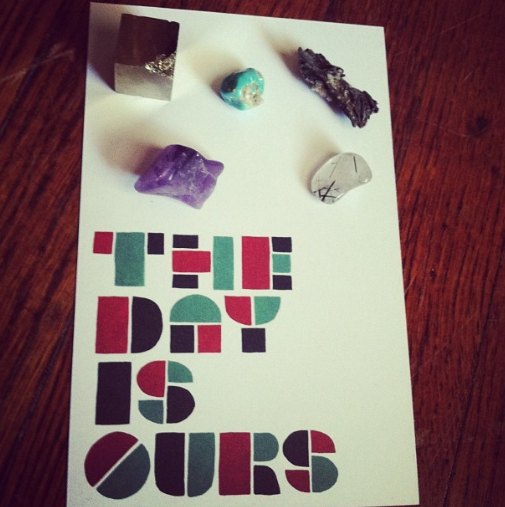 Healing energy in crystals, or at the very least, beautiful things for your eyes to see and hands to touch. 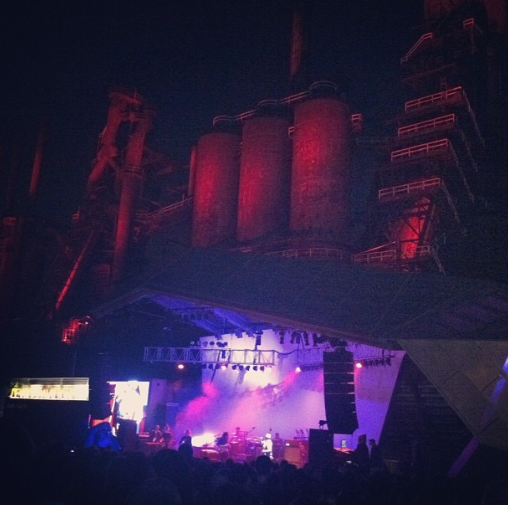 One of the most meaningful bands of my life, Modest Mouse, played a mile from my home in front of the iconic Bethlehem steel mills and I felt every feeling from the tenth grade to present day in one hour and forty minutes. They played Trailer Trash three songs in, and my soul hovered out of my body and into the crowd. It reminded me of my past and how far I have come. In those minutes I intensely missed everyone I have ever loved. I wondered what they are doing now, and felt such peace that I have moved passed the point of hurt and anger to sincerely wishing them well. I wonder if they felt it, wherever they are. I traveled to upstate New York to see my beautiful cousin get married in front of a magnificent waterfall, followed by a reception at summer camp site (!!!) where I get to reconnect with my family and celebrate a beautiful day. 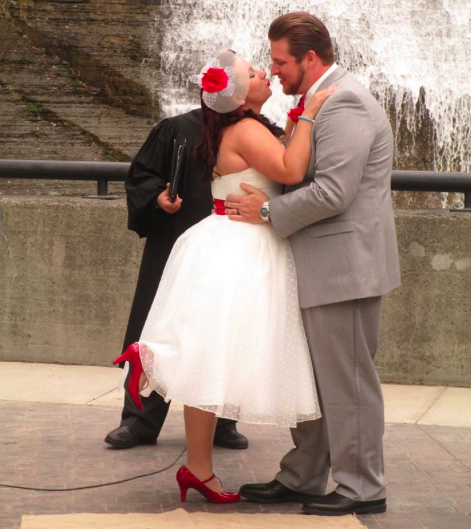 It was one of the cutest weddings I have ever seen, and I’m so proud of her. The beautiful Ellwoods, such a great rock’n’roll last name. My Mom has come to visit, and seeing her always makes me feel better, too. 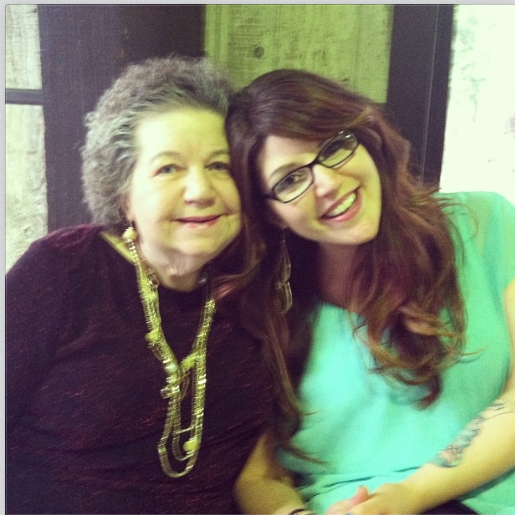 After the deaths of my Gram and my Stepdad just four months apart, I feel a new sort of connection to my Mother. And this is my Babchi (“Bob-she”), my Dad’s mother, who is over 80 years old. She has survived seven children, a seemingly infinite number of grandchildren and great-grandchildren, and cancer. Even after her cancer treatments when she lost all her hair, it grew back thick and full. She doesn’t color it. Now you know where I get it from. Babchi is Polish for “Grandmother”. I went to an art show in Easton that was so spectacular, so well-attended, I felt like I was in a big city. Everyone there was uniquely beautiful and friendly, the quality of the art was of such a high caliber, my heart swelled with pride for the Lehigh Valley. There is something to be said for sticking around to see your community step into it’s fabulous self. Even better if you can participate in some way, even if that way is to stand with your mouth agape looking at a painting that makes you feel something deeply, and telling people about it, especially the artist. Thank you. BOOM art show in Easton, PA. 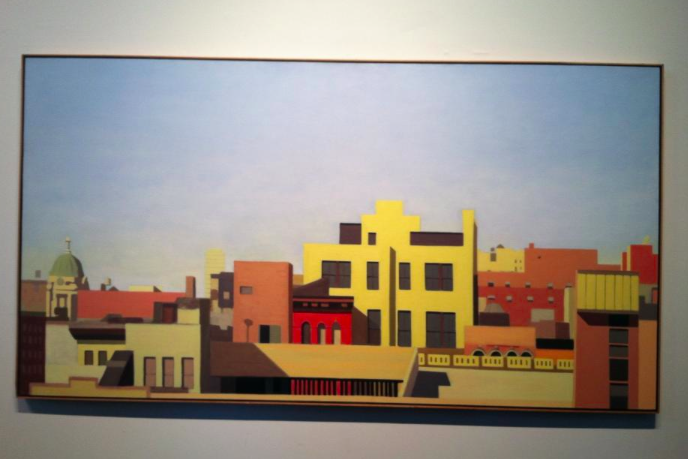 This quiet cityscape is by Bill Hudders. … Each day I’m working on finding the balance between doing my best to be productive without pushing myself to the point of physical pain. Healing is immensely important as it is already taking longer than expected. When I think about the concussion, this stupid and preventable accident, I get so angry, but anger has never helped anyone to feel better. So while I figure out how to go about my days until I can be normal Jaime K again, I have my books, some really wonderful friends, couch naps while the sun streams in, lavender tea and guacamole, podcasts and shoulder-warming walks in the sun. And along with a mental and physical overhaul, Save the Kales! is getting one as well, from the inside and eventually out. This hasn’t been simply a “food blog” since the beginning, but going forward I will write about non-food issues with even more intent. It is our stories that connect us. The past several weeks have seemed like the weather-equivalent of Eeyore: sad and gray. 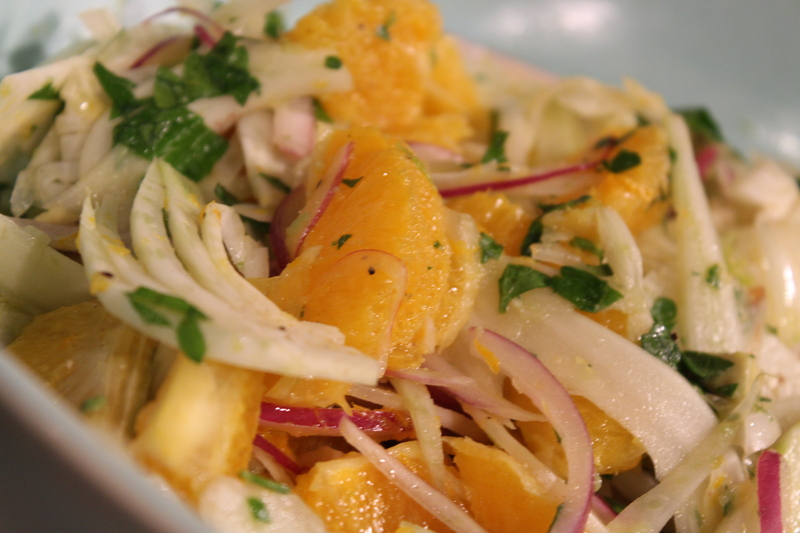 If you need a burst of fresh, sunny brightness, try this orange and fennel salad. Juicy citrus and crunchy raw fennel will, at least for the moment, transport you to an afternoon of running through spinklers and strolling through Farmer’s Markets. *Note: A mandolin is not necessary, but it’s a great time to use one if you have it. If not, carefully slice veggies as thin as you can with a knife. Add all but one navel orange to a large bowl. Put one orange aside to use for the dressing. Whisk in small bowl, pour over vegetables, and mix. In a place that bursts with artistic creativity, small boutique retail shops and is literally, hello!, “The Christmas City” (check out the locally-viral Buzzfeed post) with seasonal holiday pop-up markets, I can’t begin to write a comprehensive gift guide. There’s too much. A good problem, no? 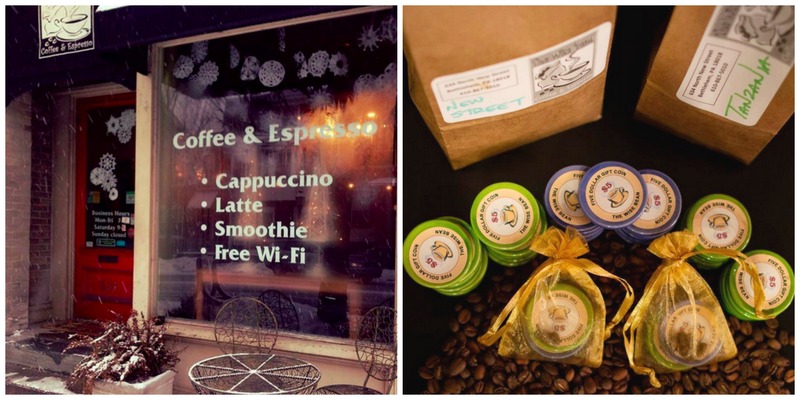 But if you’re looking for last-minute gift ideas that are special and unique to Bethlehem/The Lehigh Valley area while supporting small businesses, these are the gifts and shops that immediately come to my mind. Share some of your favorites in the comments! The stars were used as craft projects to help demonstrate geometry lessons to young boys attending Moravian school. The stars were quickly adopted by the Moravian Church as a symbol of the birth of Jesus and represented the star of Bethlehem. A small elegant, handmade glass ornament will set you back about $20 (give or take), but you may also find them in paper, plastic, and sizes that could fit in your palm to elegant lighting fixtures priced in the hundreds. 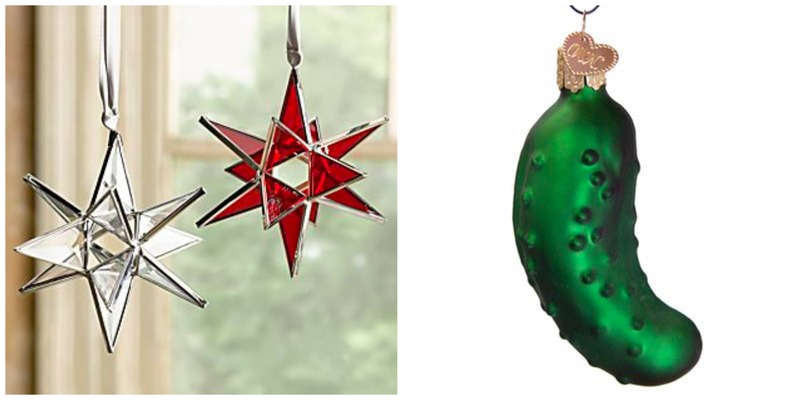 As for the pickle ornament(! ), this is a little more kitsch but just as traditional. The German tradition says that parents hung a pickle in the Christmas tree after all the other ornaments were in place. In the morning, the first child to see the pickle on the tree would get an extra gift from St. Nicholas. This is one of my favorite go-to gifts when you want to give a little something to someone who lives out of the area, as a cute reminder that someone in Bethlehem loves them. If you’re not quite sure what to get someone but want a very special gift and you have a little more wiggle-room in your budget, this is the store to browse. They specialize in jewelry that is unique, interesting and handmade, and one-of-a-kind artwork from photography to ceramics. Always classy but with a chic, bohemian twist, you can’t go wrong with anything from this shop. Take a peek at their Pinterest page. Nearly everything in MercHaus in handmade in-haus. *wink* This is where you can find my absolute favorite scented candles, neon-colored ceramic animals, fabric products like scarves, bags, aprons, and about a trillion other things you never knew you loved until you walked in. This store is a treasure of the Lehigh Valley (located about 10 minutes outside Bethlehem in beloved Easton), and it’s all the better that owners Ken and Ron are the sweetest peas and you’ll leave with hugs and perfect gifts in tow. Is it weird to want to live in a store? Listen, put a picture of the steel mills on anything and you’ve found a way to my heart. 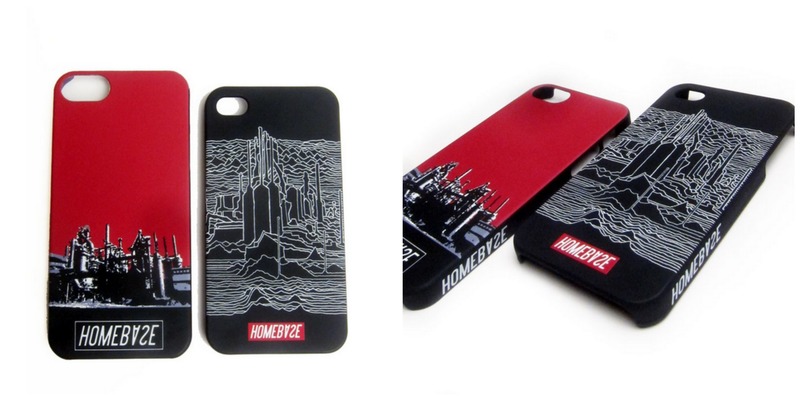 But Homebase does it again by turning their popular 610 Division design into cases for iPhones 4 and 5. Brilliant. BRILLIANT. In case you haven’t seen it, Homebase Skateshop sells t-shirts with one of the greatest outcomes of graphic design history: a mash-up of Joy Division’s Unknown Pleasures album cover art, and the Bethlehem Steel mills. They’ve turned that genius design into a portable and practical phone cover, and if you love Bethlehem as much as I do, you’ll get one immediately. Quantities limited. 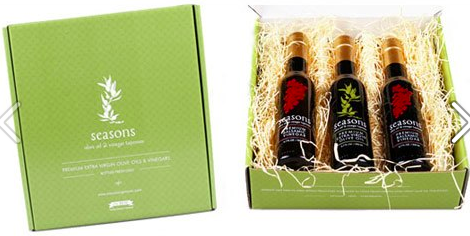 If you’re looking for the sophistication (and, um, practicality) of a bottle of wine but want something a little more out-of-the-box, consider a bottle of one of the many flavored oils or vinegars from Seasons. If oil and vinegar don’t sound special, get yourself to this shop, start at one end, and sample everything in the place. They really let you do this! 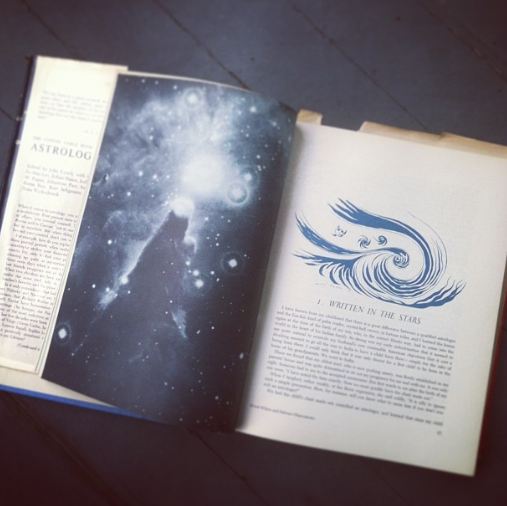 For more details, take a peek at this article I wrote about Seasons a few years ago. A full bottle will set you back an average of $12-15, but can go higher as you look to truffle oils and such. My favorite local coffee shop, and longest running indie coffee shop in Bethlehem’s Northside, has unique ceramic gift coins that function like gift cards – but they’re cuter! They come in a tiny mesh bag, perfect for gifting, and while you’re at it pick up a pound or two of one of the Bean’s excellent coffees to brew at home. What began as a handmade cloth diaper company is now a full brick-and-mortar retail space in Allentown. Here you can find anything a baby or toddler would need or want, and best of all, products are eco-friendly! Clothes, toys, personal care products, and more can be found at the store. And if you want to give an experience, check out the classes offered by Ju-ju Monkey, from Baby Sign Language to Mommy and Baby Yoga. Made in small batches in Easton, PA and sold at locations around the Valley (including The Wise Bean, see above), these jars of pickled goodies would be perfect when you want to give a little token of appreciation to someone and that candy cane taped to a card just won’t do. Who doesn’t like pickles!? With flavors like Pickled Za’atar Cauliflower and Spicy Bloody Mary Garnish, stock up on a few for yourself, too. Bonus: toss your own veggies in the leftover brine after you’ve devoured the jar. The gift that keeps giving! Buy them at these locations. And if you’re looking for a vegan + organic Christmas dinner but want someone else to do all the work, call on Chef Wendy! 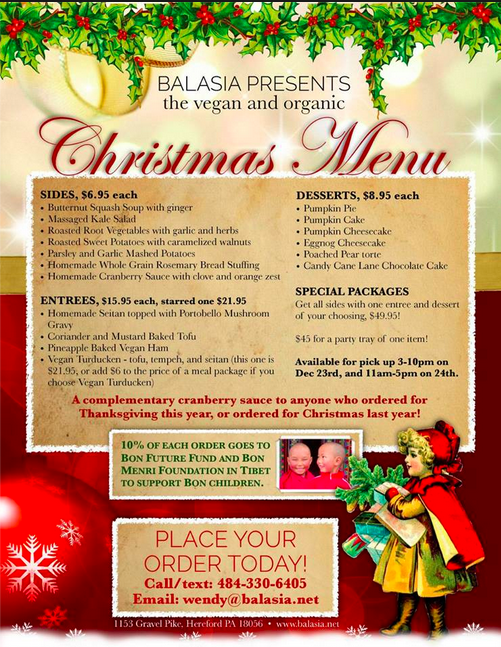 She’s taking orders for Christmas dinner through this Saturday, Dec. 21st. 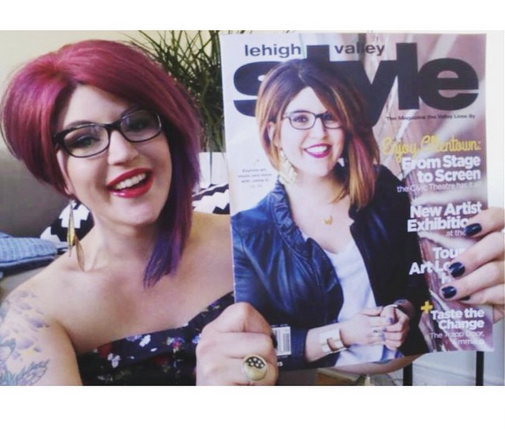 Note: I debated writing this list because, as mentioned at the top, there are so many wonderful businesses in the Lehigh Valley and I’d never want anyone to feel snubbed! A huge part of my work is advocating community involvement and small business support. I started to feel like I was four years old again, in bed and anxious to say goodnight to my stuffed platypus, because then I’d have to get out of bed and kiss + say goodnight to every other stuffed animal (there were a LOT) so none would feel left out. Then you grow up and become an adult with mild OCD! Lists can sometimes feel like that.